Think you have NSP, PSP, or saxitoxin poisoning? If you suspect that you have either NSP, PSP, or saxitoxin fish poisoning, contact your local County Health Department or the Florida Poison Control Hotline at: (800)-222-1222. Seek medical treatment from a health care provider. Some of the most significant toxins produced by harmful algal blooms in Florida are brevetoxins and saxitoxins. The health effects from these toxins can include foodborne poisonings. Neurotoxic Shellfish Poisoning (NSP) is caused by the consumption of molluscan shellfish (such as clams, oysters, scallops, mussels and other filter-feeders) contaminated with brevetoxin, which is associated with Florida red tide. Other states report cases of Paralytic Shellfish Poisoning (PSP), which is caused by a different marine toxin called saxitoxin. In Florida, saxitoxin is uniquely found in contaminated puffer fish harvested from the Indian River Lagoon. The resulting illness is called Saxitoxin Puffer Fish Poisoning. You cannot tell if shellfish or finfish are toxic by taste, odor or appearance. Please see below for more information about these foodborne illnesses. Neurotoxic shellfish poisoning (NSP) is caused by a marine toxin called brevetoxin which is present in contaminated shellfish. Brevetoxins are produced by Karenia brevis (K. brevis), a marine algae which causes red tides. Brevetoxins may accumulate in shellfish when they are exposed to algal blooms or red tide events. The by-products produced by the brevetoxins are able to cause human and wildlife illnesses. Brevetoxins are not destroyed by heating or freezing methods, so even well-cooked shellfish may transmit the toxin. The toxin is odorless and tasteless and cannot be detected by taste or smell. Transmission is foodborne. NSP is not transmitted person-to-person. Infections may result from ingesting contaminated shellfish that has been harvested from an area with K. brevis cells and brevetoxins present in the water. NSP cases have been associated with consumption of clams, mussels, scallops, oysters, whelks, coquinas and certain gastropods. These molluskan shellfish are filter feeders that can filter large amounts of the red tide algae from the water and concentrate the toxin producing algae in their gut. Shellfish harvested from red tide areas should not be eaten. Other seafood also commonly called shellfish such as crabs, shrimp, and lobster can be eaten because they do not filter water and will not concentrate the toxin. Scallops can be eaten if only the scallop muscle is eaten, as is normally the case. Scallop stew, which would use the whole animal, should not be eaten. NSP outbreaks were reported in 1995, 1996, 2001, 2005, and 2006 along the southwest Florida coast, with the majority of cases occurring in Lee County. 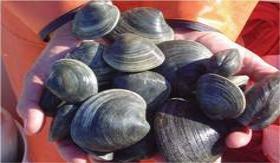 The majority of NSP cases were associated with consuming recreationally harvested clams during the summer months. Past NSP cases were associated with illegal recreational shellfish harvesting. To reduce the risk of contracting NSP, avoid consuming shellfish that was harvested from beds impacted by a red tide or any shellfish harvested in unapproved or closed shellfish beds. Paralytic shellfish poisoning (PSP) is caused by a different marine toxin called saxitoxin. PSP is also transmitted by shellfish consumption. Implicated shellfish include: mussels, surf clams, softshell clams, sea scallops, butter clams, ocean quahogs, oysters, gastropods, geoduck, cockles, lobsters, crabs, and, rarely, toxic fish. PSP cases have been previously reported in California, Oregon, Washington, Alaska, Maine, Massachusetts, and Washington. Puffer fish caught in Florida waters, such as the Indian River Lagoon, have been found to contain the same naturally-occurring saxitoxin that found in some shellfish. Consuming saxitoxin laden pufferfish may result in cases of saxitoxin poisoning. Whether contained in shellfish or in puffer fish, saxitoxin can cause serious paralytic illness if eaten.